From November 26 to December 2, CMHA Sault Ste. Marie will join the Canadian Centre on Substance Abuse and Addiction (CCSA) along with addiction prevention, treatment and recovery organizations across the country to mark National Addictions Awareness Week (NAAW). NAAW is an opportunity for Canadians to learn more about substance misuse, prevention, treatment and recovery. This year’s NAAW theme, All Walks of Life, highlights that addiction does not discriminate and affects people of all ethnicities and socioeconomic classes. One in 10 Canadians suffer from some type of substance use disorder and approximately six million people will meet the criteria for addiction in their lifetime. This year’s campaign aims to raise awareness around and reduce the stigma and stereotypes often associated with substance use, addiction and recovery. 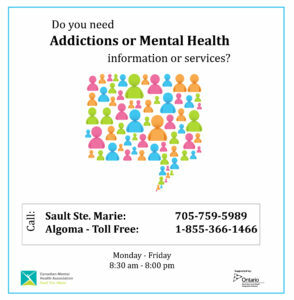 For more information on addictions, visit the CMHA Sault Ste. Marie program page.